Use the tabs above to view the printing, scanning, photocopying and faxing services available at the medical libraries at each MUHC site. 1 – Note that Follow-Me printing is not available inside the library. 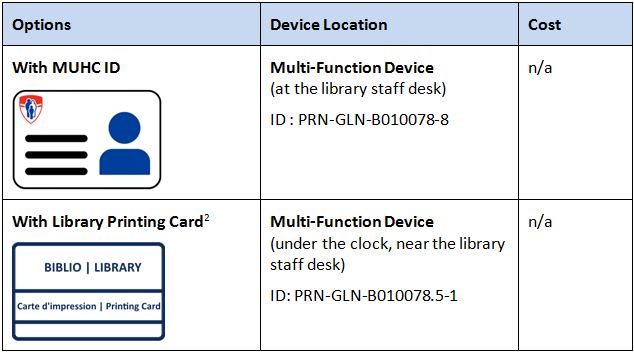 2 – Library Printing Cards may be purchased (refundable 5$ deposit) and charged with funds at the Staff Library Desk during opening hours. 3 – To print on 8½ X 14 (legal) paper, select Printer 2. 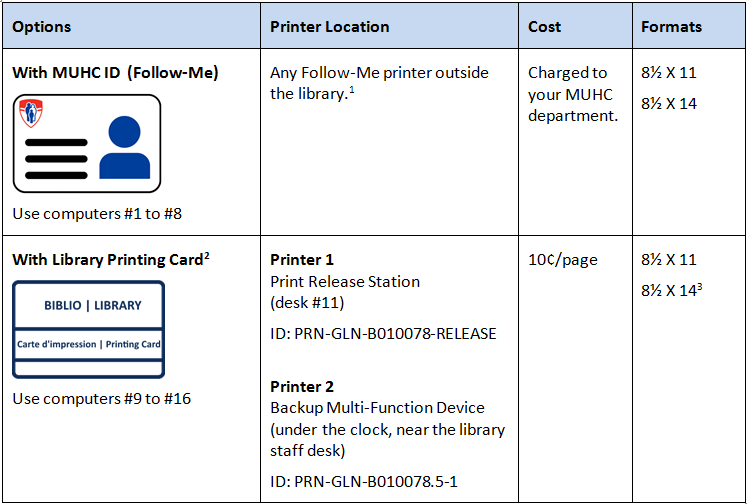 Library clients wishing to print must purchase a copy card for the MGH library printers. Rechargeable copy cards ($1.00 – refundable when you return the card) are available from the card dispenser. Any amount can be added to a copy card. The cost is $0.10 per page. Clients wishing to print must consult library staff. The Neuro Library has a scanner on McGill’s uPrint network –MUHC employees should consult the Neuro Library staff for assistance.